As New Zealand’s only real theme park, Rainbow’s End can be a great day out for those that enjoy the thrill of rides. To some extent there is something for everyone from a soft play area for toddlers, to a mini-rides area for under 8 year olds and everything from dodgem cars, to bumper boats to things that spin, swing, turn upside down and sometimes all of the above, in the main section! Your families’ enjoyment at Rainbow’s End can depend on a few things: If you’ve been to overseas theme parks e.g. in Australia or America, Rainbow’s End can seem quite small in comparison. But luckily for us, it’s cheaper than large overseas amusement parks! If you’ve only really been on fairground rides when they come into town, you’ll love Rainbow’s End. Height, age and scare factor can also play a part. 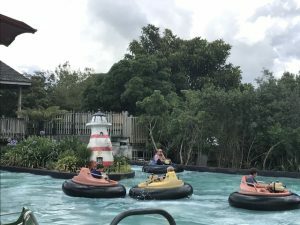 Older kids, over 130cm who love speed and to be scared, will get the most out of the main park as they’ll be able to go on almost all of the rides (some rides have a height restriction of 120cm). You can pay a reduced price just to access the rides in the Kidz Kingdom. For kids that are 90cm+ and/or not sure about pushing their fear factor, this area might be enough. There is still a roller coaster, free fall, carousel, pirate ship and other rides but they’re all mini, slower versions of the main park. 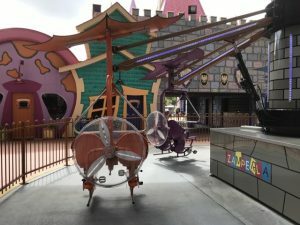 This area is perfect for smaller kids, whose parents don’t necessarily want to go on rides with them but would be frustrating for kids in that in between stage (perhaps aged 6-8ish) that actually want to be on the proper rides, which unfortunately you walk past to get to the Kidz Kingdom! Rainbow’s End is still a good activity in showery weather as there’s enough undercover places to shelter (the kids Kingdom is completely undercover, and there’s cover over the entertainment area too) but it would be unpleasant in non-stop downpour and some rides like the family karts stop operating if the track is wet. On the plus side, wet or showery weather is likely to see fewer people and therefore less or no queues for rides! Buy your tickets online. 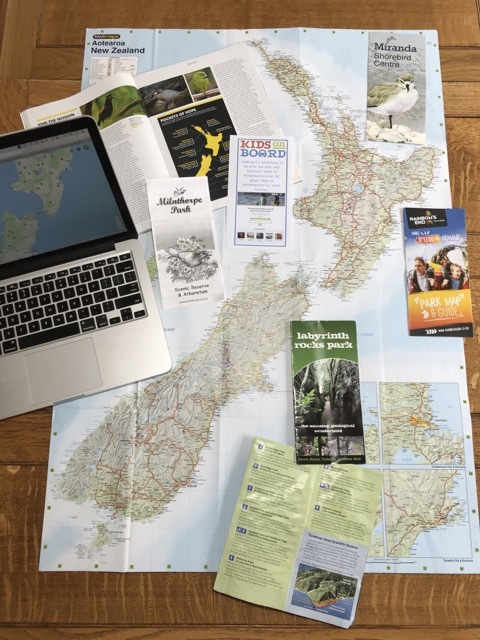 Check the www.bookme.co.nz website as soon as you have a date for going. Otherwise you can still save money by booking at the Rainbow’s End website anytime before your visit. Keep an eye on the Rainbow’s End Facebook page for special deals. Are you an AA member? Have your membership card ready to get a 20% discount on a superpass. Take all your food and drink with you. There are covered tables and chairs to eat your own food. Also: Go early, preferably when it opens at 10am. This will secure you a good spot in the car park but also mean that there’ll be fewer queues and you can go on more rides thus making the most of your day out! Check the website for which rides will be closed before you buy tickets – if you’re favourite rides are closed for maintenance, you might want to rethink your plans. Price: all prices listed are for standard single person tickets. Online and multiple tickets (e.g. 1A+1 or more K) will have discounts applied. Superpass Adult (access to the whole park) $62. Superpass Child (2-13 yrs, access to whole park) $52. Kidz Kingdom Child (2-5 yrs) $52. Spectator’s Pass (NO rides) $18 entry on any day including public holidays, school holidays and weekends. Under 2 years FREE but must be accompanied by an adult spectator or pass holder. An example of family passes bought online: 1A+2K $145, 2A+2K $200. For all prices bought via Rainbow’s End, please check here.